MALIGAYANG PASKO PO SA INYONG LAHAT!!! Let us keep the Paete Spirit Alive!!! would like to extend my gratitude to Paete Chapter for offering to work on family listing, volunteers, food, tarpaulin and cleaning after the event..salamat po Pres Andy Villarin. Paulit-ulit po akong nagpapasalamat sa mga conributors, sa tulong po ninyo 420 families will receive pamaskong handog ng Paetenians international..
Gen Bay 2 army trucks and 8 soldiers will transport the goods to our town plaza for re-packing and distribution on the 23rd. Paete Chapter is in charge of the short program and distributions with the help of Gen Bay. I would like to thank each one of our contributors. Dahil po sa tulong ninyo 400 families ang mabibigyan ng Pamaskong handog ng Paetenians International. from the bottom of my heart " I salute all of you for your concerned, kindness and generosity". My prayer is all Paetenians abroad should be united and not to stop helping our kababayan in needs during this Christmas season. Naway kasihan kayo ng mariwasang buhay at magandang kalusugan. Yes I meant it is so fulfiling thanks good catch.. I hope what aureliap meant was "It is so fulfilling" and not "Isn't so fulfilling." Thank you to all Paetenians who are concerned! Good news is for every $30.00 you sent 2 families will have their Noche Buena for this coming Christmas Eve. Isn't so fulfilling that we do something good this holiday even in a little way. I hope and wish everyone read this will do the same. Its not too late yet you can still send your donation. So far we are covering 300 families and wishes to increase this number. the more the merrier. Maraming Salamat Po! God Bless All of Us.. Reminder to the other chapters and Paetenians all over the world please send your donation I am praying hard that you will open your wallet and will generously send your donation now na.. 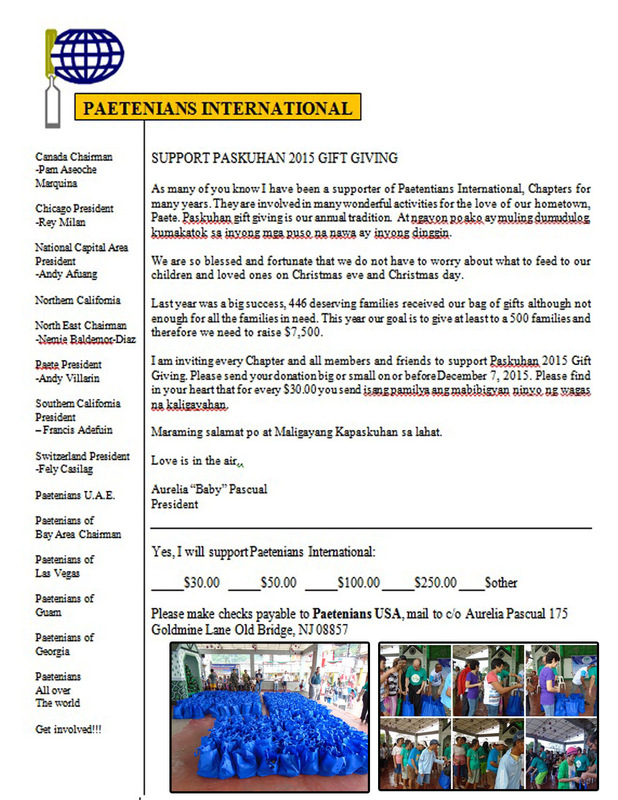 Check payable to Paetenians USA..
Willie & Margie Rondillo $50. Rene & Daisy Madridejos $50. Julian & Gloria Basa Caguin - $56. Primo & Imelda Dalay Basa - $20. Jerry & Julie Basa Nubla Nall - $20. Rochelle & Melissa Basa Gatan - $20. Mario & Agnes Jimenez Basa - $20. Ramon & Ampy Cagayat - $100. Ebenezer & Lily Valdellon - $100. Omar & Delia Adefuin - $50. Chris & Army Cagayat - $50. Marilou Villarin Encina - $50. Margie maraming maraming salamat sa tulong mo..
Maraming salamat po sa inyong lahat..God bless your heart..
Gusto ko lamang pong linawin na Ang Paetenians International ay wala pong agendang pang pulitika..
Ang nais lamang po namin ay makatulong sa ating mga kababayan na nangangailangan sa abot ng aming makakaya. Huwag pong bigyan ng kulay Ang aming pagtulong specially this coming Paskuhan 2015. We all know this is our annual charity event and because of this coming election I will appreciate everyone cooperation and understanding for not using this as one of your campaign segment. Let's be all in one family and SUPPORT Paskuhan Gift Giving. Thank you to those who have given generously to Paskuhan 2015. We, as members of Paetenians International, have many reasons to be thankful this Thursday as we gather with our families and loved ones for Thanksgiving 2015. Thank you again for "giving" back to Paete! For those who did not send their donation yet please do it now..be kind to others..